Explore our favorite sights easily reachable in one day. 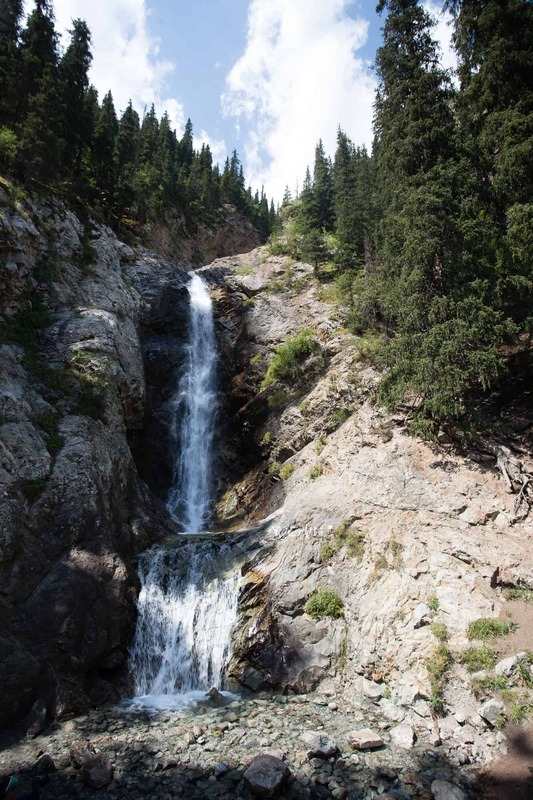 While Karakol town itself offers a little something for everyone — from food and cultural tours to historical sites and markets — it also serves as a great base for day trips to stunning natural sights, outdoor experiences, famous landmarks and day treks. 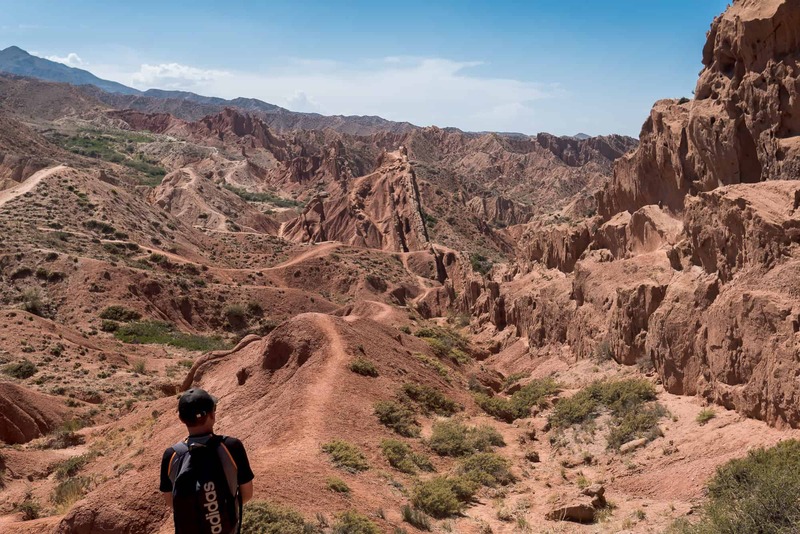 Located in the eastern part of Kyrgyzstan in the Lake Issyk-Kul region, Karakol has long been a hub for adventure travelers and the great outdoors. 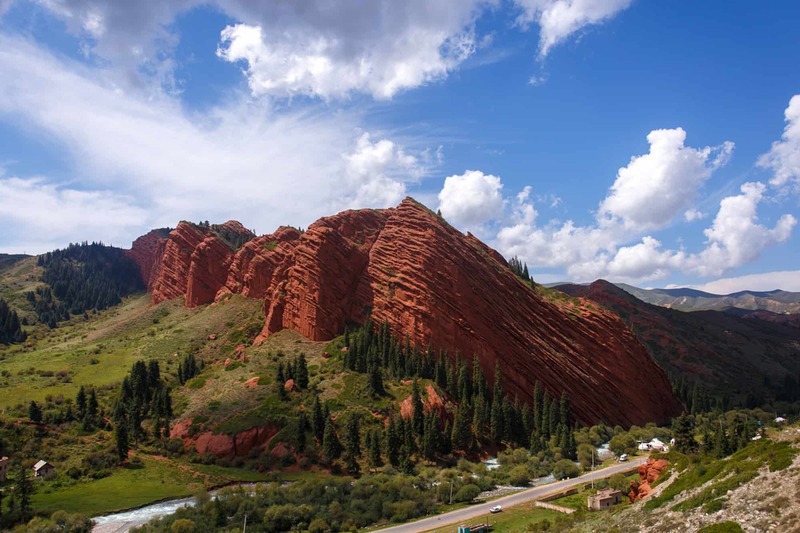 Located near to Karakol you’ll find beautiful mountain scenery with snowy peaks and spectacular views of waterfalls, lakes and red-rock canyons. 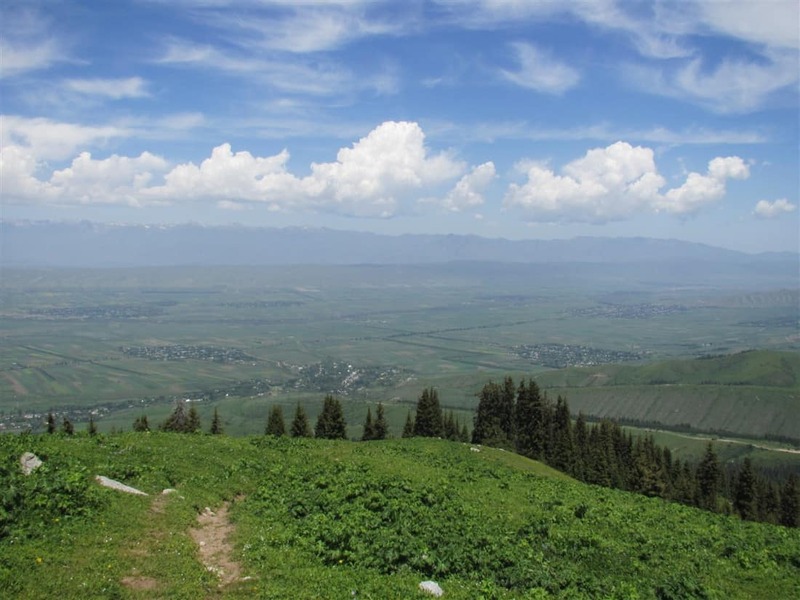 These make for a perfect day trip from Karakol so that you can immerse yourself in nature and adventure for the day, but also return to the comforts and services of the town in the evening. Here’s our list of best places to visit and things to do as day trips from Karakol! Note: All public transport and logistical information for each place is included below to allow you to easily plan and organize your trip independently. However, if you prefer to have your own driver or guide for the day to provide for maximum flexibility, please get in touch with us and we can make arrangements for you with one of our trusted driver partners and guides. 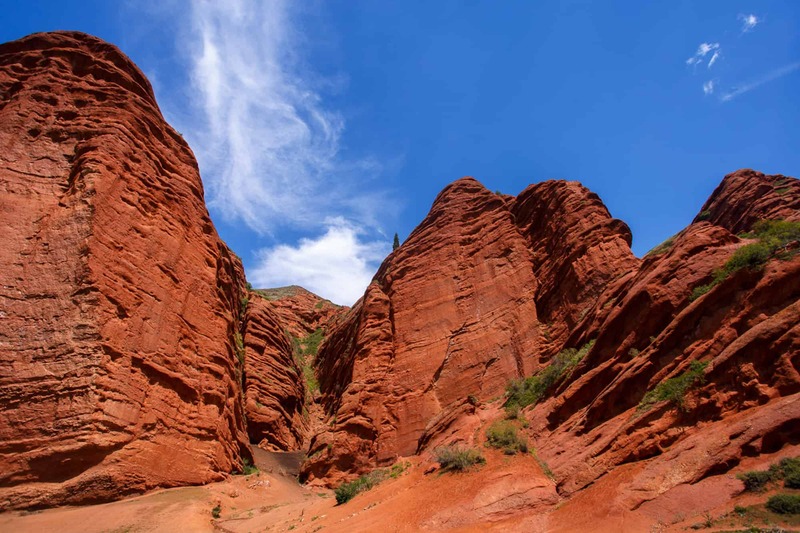 Located just 28 km west of Karakol in the foothills of the Terskey Ala-Too Mountains, Jeti-Oguz attracts many visitors each year with its breathtaking “Broken Heart and “Seven Bulls” red rock formations. But, the real treasures here that can’t be missed are the valley of wildflowers and waterfall called “Girl’s braids” located in nearby Kok-Jayik. This combination of natural attractions makes Jeti-Oguz valley the perfect place for hiking as it has many options for either a short or day-long hike. We recommend the 3-hour hike that begins in Jeti-Oguz resort just after Seven Bulls rocks to Kok-Jayik. Jeti-Oguz is worth visiting almost any time of the year, and it is so accessible to Karakol that you can be back in town for dinner after a full day enjoying these views and outdoor adventures. How to visit Jeti-Oguz: To get to Jeti-Oguz from Karakol take marshrutka #371 or a shared taxi from the Torgoeva/Aldasheva intersection to the Jeti-Oguz resort. The cost for the marshrutka or shared taxi is 100 som/person. Alternatively, you can hire a private taxi for 800-1000 som/per car one way. 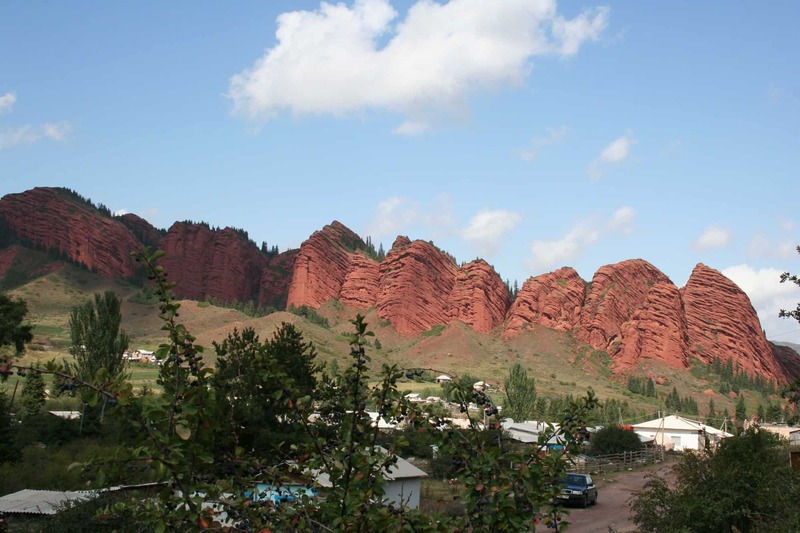 After you reach the Seven Bulls rock, walk towards the Dzhety-Oguz resort and from there you’ll find the trail for the 3-hour hike to Kok-Jayik valley. Note: Sometimes during the summer the buses goes only to the Jeti-Oguz village instead of the resort so be sure to check with the driver that the marshrutka is going to Dzhety-Oguz Kurort (In Russian: жети огуз Kurort), which is 15 km further from the village towards the mountains. Recommended departure time: 8:00 - 9:00 AM from Karakol and 4:00 PM from Jeti-Oguz Resort bus stop so that you can be back in town for dinner and relaxation. 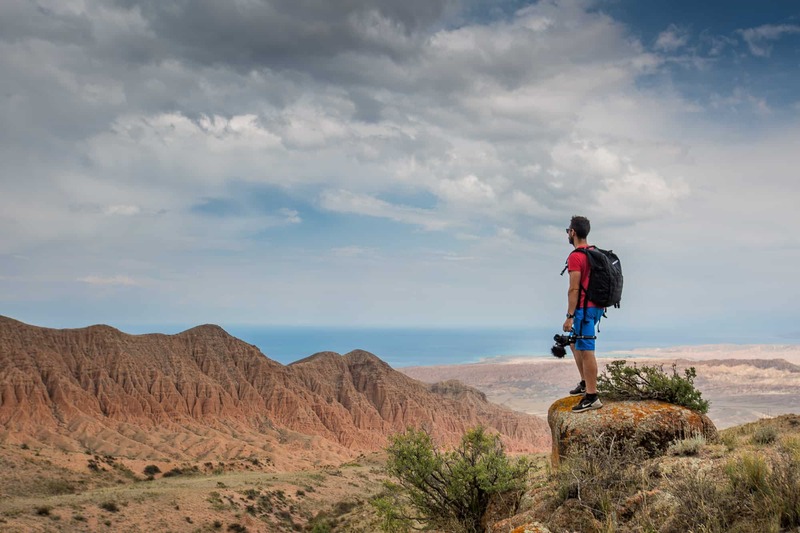 The south shore of Lake Issyk-Kul is filled with many magical natural sights and experiences, many of which can be included in a one-day trip from Karakol when you travel by car, bus or even bicycle. One of the favorite sights here is Skazka Canyon, known in English as Fairytale Canyon. The reason for its name is that while walking through the canyon, you will find yourself in a world full of red, pink, orange and yellow colors of rock formations and feel as if you are in fairytale. 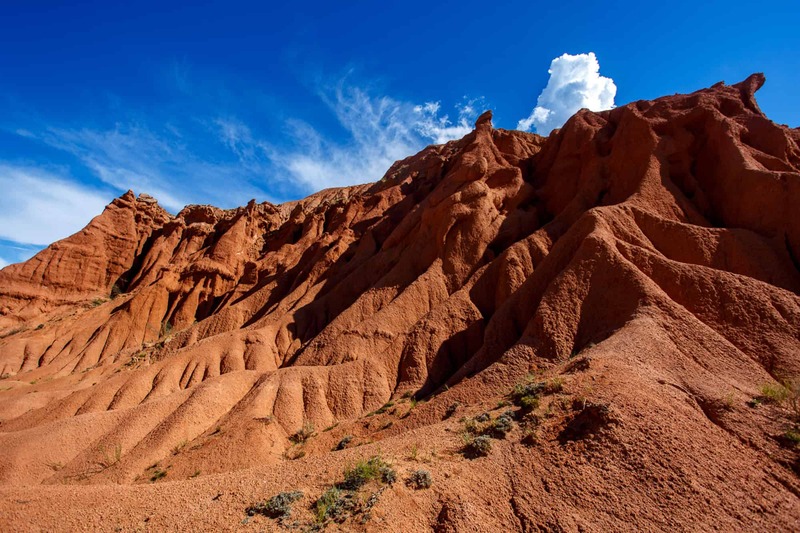 Skazka Canyon is located just two hours from Karakol at the southern part of Lake Issyk-Kul and around 4 km from the Tosor village. You can drive into the canyon by car, but you will need a solid 4WD because other vehicles can get stuck in the loose sand easily. Once you reach the end of the road you can walk freely between and over the rock formations… and use all of your imagination to explore this magical place as you like. How to visit: Located 120 km from Karakol this place is easy accessible via shared taxis and marshrutkas that leave from the Southern Bus Station on Toktogula Street near the stadium. A shared taxi or bus/marshrutka costs an average of 150 som per person. The private taxis cost about 2100 som/per car. After you reach the Tosor village in about 2 hours get out right on the main road at the sign “Skazka Canyons.” Then walk towards the mountain (away from the lake) from the main road to the entrance. Recommended departure time: 8:00 - 9:00 AM from Karakol. To go back to Karakol from the main road near the “Skazka Canyon” sign just flag down one of the marshrutka to Karakol or Kyzyl-Suu village. These marshrutkas go regularly throughout the day. The canyon is a national park so you will have to pay a small entrance fee (around 50 SOM). Plan to spend at least 1 hour there, but 2 hours or more would be better if you want to explore everywhere. Hiking shoes are recommended as the rocks can be slippery and uneven. It is not very accessible when wet, so try to plan your trip for dry weather. 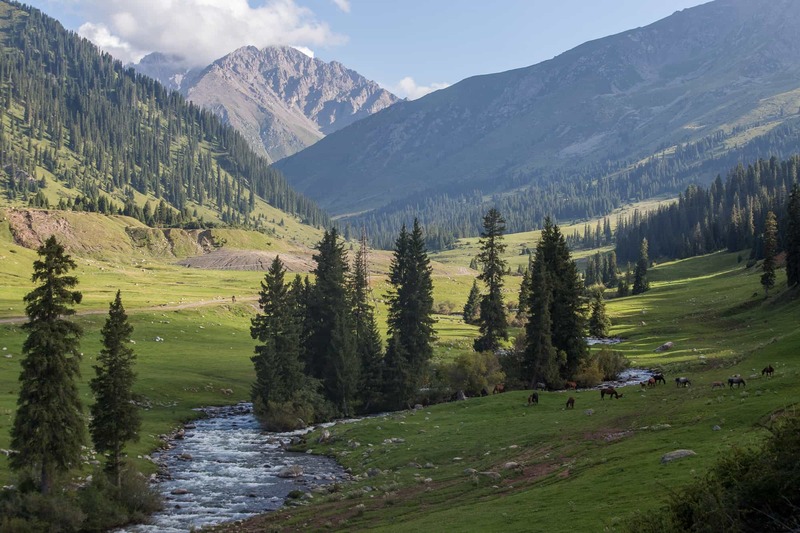 If you are tired of the city bustle and just want to spend a day surrounded by beautiful mountain scenery not far from Karakol, we have a solution for you: Jyrgalan Valley. Located just 1.5 - 2 hours driving from Karakol, Jyrgalan Valley has become one of the great places to become one with nature thanks to its stunning and spectacular mountain views. In the course of a day trip from Karakol you can enjoy plenty of outdoor activities such as horseback riding and bike tours. How to visit Jyrgalan Valley: Take marshurtka #331 from the Big Bazaar bus station at 8:30, 13:30 or 17:30. The journey takes about 1.5 - 2 hours and the price is 80 som/per person. If you want a direct transfer from your hotel to Jyrgalan in a private taxi it will cost about 2000 som/per car. Get in touch with us to help arrange a trusted driver for you. During one day trip you can do some short hikes to waterfalls and some natural attractions. However, if you have time in your schedule we recommend two full days to truly enjoy the place. There are several guesthouses in the village where you can stay the night and eat a home-cooked meal. For more information on available activities and accommodation in the area please go to Jyrgalan.com or we can help make arrangements for your visit at the Karakol Visitor Center. 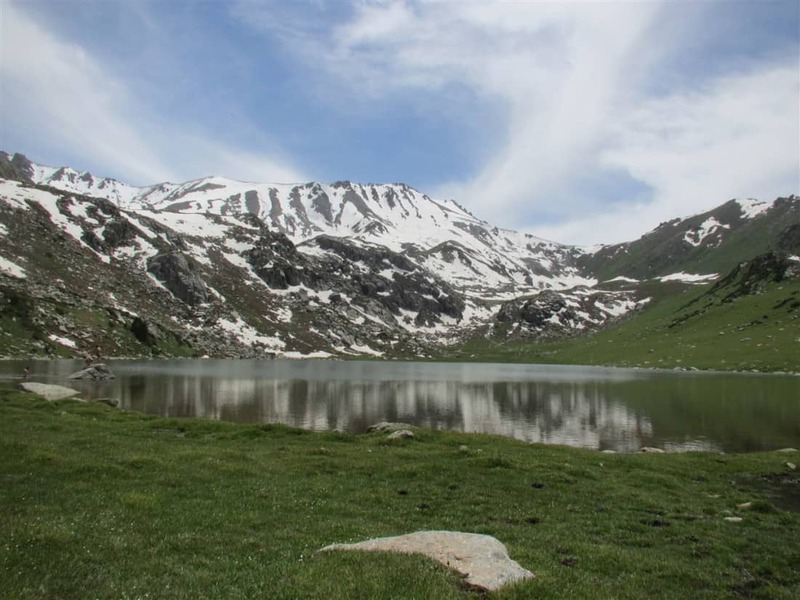 If you love hiking and trekking, it’s almost impossible to imagine a visit to Karakol that doesn’t include a trip to one of the nearby alpine lakes for which region is famous. The closest one to Kaakol that makes for a great day trip is Kol-Tor Lake. 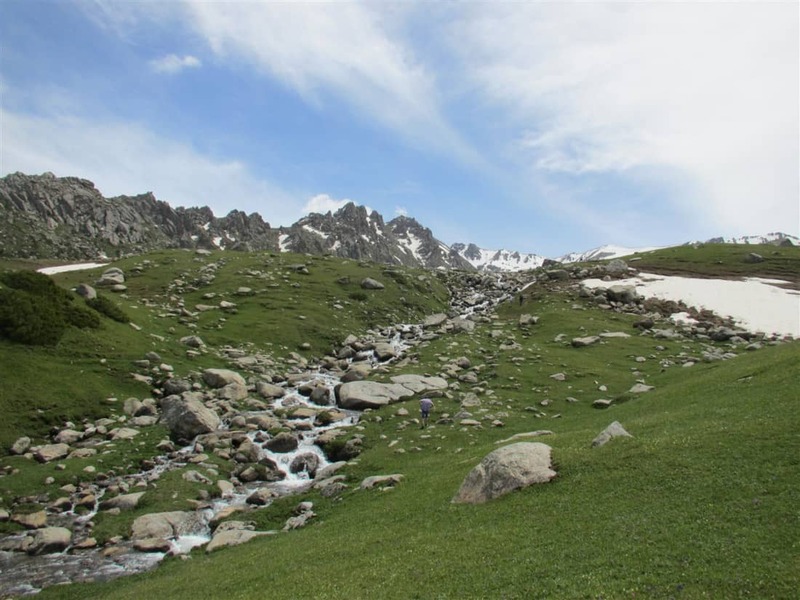 It is located at 3,084 meters in the Jergez Valley, which is an area that travelers are just now beginning to discover. This easy level hike is a great opportunity for you to truly enjoy the stunning scenery filled with alpine lakes and snow-covered peaks. Whether you’re a beginner or experienced outdoor adventurer this hike is just right for you! Check out this guide on how to do this trek. How to visit Kol-Tor Lake: There are several options how to get there: 1) take a shared taxi from Big Bazaar Bus Station 50 som/per person; 2) or take a private taxi for 600 som per/car. Recommended departure time: We recommend you to start this trip early in the morning, to be there by 8:30-9:00 AM. 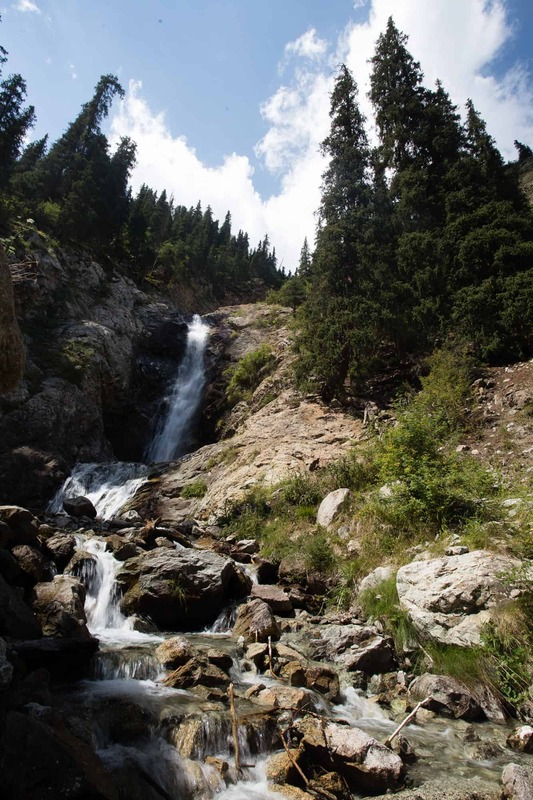 The Barskoon Waterfalls are protected area located 100 km southwest of Karakol on one of the tributaries of Barskoon River. The Barskoon Valley contains several waterfalls that travelers can hike up to and enjoy. At the foot of the mountain you can also enjoy the beautiful Barskoon River where traditional Kyrgyz yurts are built in the summer months. You can stop in one of the yurts to try kymyz, a traditional Kyrgyz drink, while enjoying the beauty of the landscape. 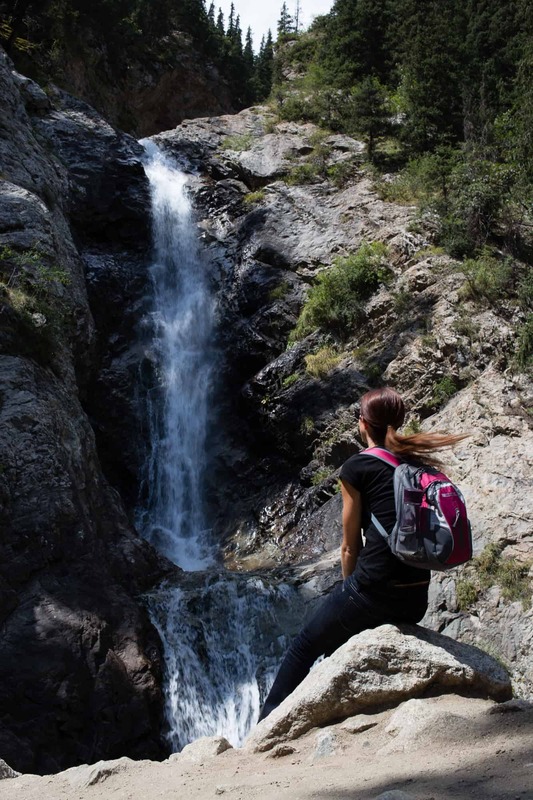 There are three amazing waterfalls that can be seen within a few hours of hiking, making it a great one-day activity for anyone who enjoys hiking and picnics in nature. Make sure to bring a lunch and hiking boots! How to visit Barskoon Waterfalls: Take a marshrutka from the South Shore Bus Station (corner of Toktogul / Torgoev streets) to Barskoon Village for 100 som. This will drop you off in the village and you’ll need to walk 15km to the waterfall. Alternatively, hire a private taxi for 3,000 som (one way). Note: it will be hard to find marshrutkas/taxis back from Barskoon after 5PM, so plan your day accordingly.